So I am joining in on the Dog Days of Summer giveaway. 50 one-sided mommy cards of your choice. Choose from any of the designs on the Mommy Cards page. Please note that these cards aren’t for moms only – you can use the designs for calling cards, business cards etc. So please, feel free to enter even if you are not a parent or a parent to a young child!! Also, they make a great gift for moms you know. To enter, leave a comment and let me know what your favorite design is. I’ll close comments at 12:01 a.m. (CST) this coming Friday morning, July 27, and I’ll draw a random winner from the list. I’ll announce the winner sometime of Friday. 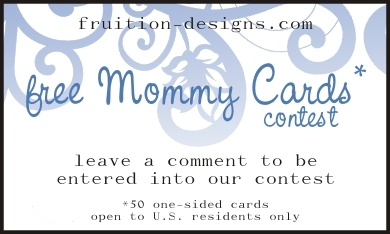 **Additionally, anyone who doesn’t win and would still like to order any Mommy Cards from Fruition Designs can receive 15% off any Mommy Card order placed before August 15th by mentioning my blog when ordering. It’s so hard to pick a favorite! I think I like the Maureen Mommy card the best! Oooooh! Pick me! I like the Melissa. I LOVE these — saw them on Big Mama’s site, and think they are the cutest things ever. (Maureen and Beverly are my favorites.) Oh, pick me, pick me! oh it’s hard to choose. I think my fave is either Tera or Jamie. If I win surprise me … They are all SO darn cute! Sending warm wishes from North Carolina! I’d pick Melissa or Tera! Love it! P.S. I ADORE the TERA design! Sorry ~ forgot to say that I LOVE the Beverly card design! I love these! Count me in! I just love ALL of them but especially the BEVERLY cards. Such a great idea! I couldn’t pick just one – I liked Mary, Patty and Melissa. I have been wanting some mommy cards for awhile now. I like the Patti or the Maureen. I can’t decide they are all beautiful. Okay, with a child named Rebecca, my favorite has to be the Rebecca cards. I also like the Tera design as well. Thanks. It would be so hard to pick! Sign me up! I love the Melissa design! Please count me in. I can’t decide–I like Melissa and Beverly! Of course, I want to be included! This is such a cute idea. I love the Tera design. Please include me in your drawing. Now THESE would be handy! Please pick me! I love these! I would love some! The Kate mommy card would thrill my daughter, a new mommy. Thanks. They are all beautiful, but I think I would pick the Melissa one. Thanks! I love the cards! Sign me up please! I like the Maureen ones! The Tera and Rebecca are my faves. Ooh! I want the Tera ones! Really? I have to pick a favorite? They’re all so great. What a clever idea for a product. I guess the Jamie is my favorite. Fabulous idea. Please count me in. Can’t decide between Natalie, Marla and Tera cards. My own cards? That is wild!! 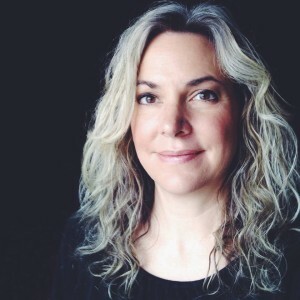 I love your new blog and Wow! I love your style and creativity! I do not have any small children or a business but I just wanted to share how I love your designs. They are too cute…it was so hard to pick, but I think I like the Jamie the best. These are soooo cute! I’d love to be entered in your drawing! Thanks! I like the Kate design! I WOULD LOVE to win this!! Thank you for the opportunity!! Love the Maureen card! All so cute, though. Thanks for sharing and best wishes with your business! These would be great for my sister who is mommy to a 4 year old and two 3 year olds….she’s a buzy lady! Too cute!! I love the Kate cards!! Just adorable! And, I’ll need these when my oldest starts school next month. It would be so hard to choose one design, but I’m sure I could if I win! I’ve been eyeing these cards for some time now! Please count me in, and thank you! I love the Maureen card design! They are all wonderful, please count me in! I love these, I could so use them for Children’s Ministry cards. I love the Tera and Natalie designs. I like the Mary, the Rebecca and the Maurine Cards. I liked the melissa design…although it was hard to decide. I like the “Melissa” and the “Maureen” cards the best. Beautiful, and a great idea! Oooh these would be so great to have! Kate Michaels is my fave. Thanks so much! The Tera one is SOOOOO me! i’m going to have to ponder which one I’d want. i love them all. Hard to choose here too – leaning towards the Mary card as I love that rich color. But they are all wonderful. Nice giveaway, thank you. Love Melissa! Count me in please! I think Maria is my favorite but there are a couple of other VERY close runners-up! It was so hard to pick just one… I love them all, but I would have to say that the Maureen is probably my favorite! I hope you’ll visit me, too – I’m #180 at the Bloggy Giveaway hub! I love these cards! I have several favorites. I like them all but would choose tera or cassandra. I love the Tera cards! Count me in please! They are all so pretty but I like the Maria the best. I love the Jamie style. They are all beautiful, though! Please count me in! thanks! We are looking for cards for our Moms group to give out to women in the community that we meet! What a great idea! Love these cards! Count me in!! I love the Kate cards. Love it. Pick me! Those are really cute! I’d love to have some! They are ALL so lovely, it’s so hard to decide. As of this moment, I think I like the Marla Paisley the best, but then the Marla Stevens is pretty cute, and I like the Tera one… gosh. I don’t know…. Enter me, would love some of these! Kate & Beverly are my favorites but, I love them all. I’d love them. I think the Rebecca is my favorite. Very nice work you do. Maureen is my favorite… I’d some some! Tera mommy cards are my favorite. They are great!! I love visiting your site and can’t wait to “meet” your next addition! And you don’t even know me! One of my dear friends lives in Nashville, so maybe one day I will get there! Thanks for visiting! I really like the Melissa Mommy card. What a fun idea! I like the Maureen design. I’ve been wanting some of these. What a cute idea! I like the Tera best, I think! Stop by my giveaways too if you have a chance! I would love to win. Please count me in. Thank you. I have to pick just one? They are all so great! I guess I like the Mary or Tera one best. Oh so cute. I’m in. Love them! Please count me in! I have always wanted some of these cards! They are so cute…count me in! I must have these. They will help me remember my name! So hard to pick, but I do love the Kate Mommy card, please count me in! I have been coveting these cards for quite some time now- I’d love to win them! I’m torn between Rebecca and Jamie. what a grand idea…love it! count me in! These are great! Count me in! They are all so Cute!!! I would love any of them! gosh, i’m totally wanting some mommy cards! I’ve seen your cards before and love them! I love the Tera Mommy Card design. Thank you! The longer I looked at your designs, the harder it was to choose a favorite!– but I’d have to say I think the ‘Melissa’ one is especially lovely. Cute cards! I think my favorites are Terra and Betsy. Thanks! I’d love to win! Count me in & thank you so much! I have always wanted some of these cards. I would love to be entered. I think I like the Mary Mommy Card the best ’cause I like red. I think I like the Jamie cards the best! Do I HAVE to choose? I like Tera, or Kate, or Maureen the best. I like the Kate cards! I would absolutely love to win the Beverly card for my daughter. Apparently I’m losing it. I could have sworn I’d entered your contest. Sigh. Please count me in. Great giveaway! I’d like enter!! Those are beautiful cards! After careful consideration, I think I like the Jamie cards best. Thanks for the chance to win! Maureen. Love it. Sign me up. Maureen, too! Count me in, please! That is such a great idea! It’s hard to choose just one. I think I’d pick the Beverly card. So cute! I like all of them, but the Tera is calling my name! Mine will be a Grandmama card! Love this idea! Please include me. Okay…I love Mellisa and I love Tera. I can’t decide. If I win, I’ll try to narrow it down. I just love this idea!! I love them all, but I think Mary is my personal favorite. These cards are gorgeous, and a great idea. I had a hard time picking my favorite, but I think I’m sticking with “Tera” for now. Your designs are just wonderful! So hard to choose just one favorite; I think I like the Melissa and Kate the best. I just love the Tera and the Maureen card designs. Great give-away! Thanks. I love the Tera cards! Love me some poka dots!! Thanks for entering my giveaway…with a little one on the way, a sling would be so perfect! I couldn’t just pick one! Do you have a mult-pack? I love the Maureen, Melissa, Betsy & Tera! what a great idea! please enter me for the Beverly! They’re all so cute, it’s hard to choose! I think I like the Tera and Melissa best. Please put my name in. These are really nice! I like the Maureen design the best I think. tough call but I think I like the Tera card best. Pick me, pleeeeze! So cute, and I’ve never seen these before. Tera Card is my favorite. I like the TERA! Please enter me! I like the Natalie card! Oh, these are cute! Please count me in!! Ohh! i like the Melissa. I would make them Teacher Cards. This way, teachers could have a free homework pass card, a free time card, a caught doing good card, etc. thanks for visiting my blog, please enter me in your drawing. I have a second drawing if you want to enter. as a mops coordinatoor i could really use this! Count me in. Go take a look and enter our give a way too! I LOVE the Maureen Mommy Card…very hip and cool…hope I win so I can pass them out to everyone!!! OH MY WORD! This is so cool! I love the Melissa Card, the Kate Card, the Maureen Card, and the Marla card! So many choices, and so little children. I just spent way too much time choosing which one but I’ll go with the Mary card. Whew! Now I can go on with my day…. These are awesome! It would be a hard pick but I like the Tera. Thanks for sharing! Oh, I would love the Maria Mommy Card in blue, if possible! I love your designs! Seriously, those designs rock. I would be tickled with ANY of them. Man, I’d be happy with any of them, but my favorites are the Natalie and the Tera–I must be partial to circles. I love them all. I would probably choose the Kate but would be happy with any of them. They’d certainly beat the scraps of paper I often have to use. I love the Tara and the Beverly cards! Too cute! I love Tera – but in fact I LOVE THEM ALL – the whole Idea! BRILLIANT Please sign me up! Theres are the coolest things that I have ever seen!!!! I Love the Beverly and the Maureen! hmmm, if I had to choose I guess I would choose the the Maureen. What a great giveaway, Thanks! These are so awesome! I like the Mary. I’m restarting up a ceramic business and I’ve been thinking about business cards but I’m clueless what I want. I’m not a mom, but I love your giveaway. If I can be a part of it, I LOVE both the Melissa and Maureen designs. If I cannot be entered, I completely understand. Thanks for blessing us with a giveaway! It’s very hard to choose, but the Tera card is my fav…. Wow! It’s like Christmas in July! Thanks to all of the wonderful bloggers that are participating in this great give-away!!! I like the MARIA and the JAMIE cards bes, but they are all lovely! I really like the Maureen Mommy card. Count me in! These are awesome. I think I like the Melissa the best. Please include me and thank you! Beautiful. What a neat idea! These are lovely and such a fun idea! I really like the Kate one, and Maureen too. Please count me in~ Thanks! I could use some of these. I like the Kate Mommy Cards. Count me in. Great designs! I like the Mary Mommy card! Thanks for the chance to win this! What a fun idea! I love the Melissa card. It’s a toss up for me because I love them all! My favorites are Jamie, Mary, Tera! Love them! I love both the Maria and the Tera! I’d have to think about it further…LOL! Too many cute ones to choose from! I love the Marueen, Beverly, Marla, Melissa & of course the Rebecca – suits me well I think! ;) If I win I promise I won’t be so indecisive. Thanks! Count me in! What a fablous giveaway! I would have to say that the Tera Mommy card is my fav. The melissa mommy cards are adorable! I really like the Melissa design. I love, love, love the Kate design.